A few months ago, when I was heads down finalizing the distributed database in Spinn3r, I was exceedingly curious about what other DBs are using for compression. 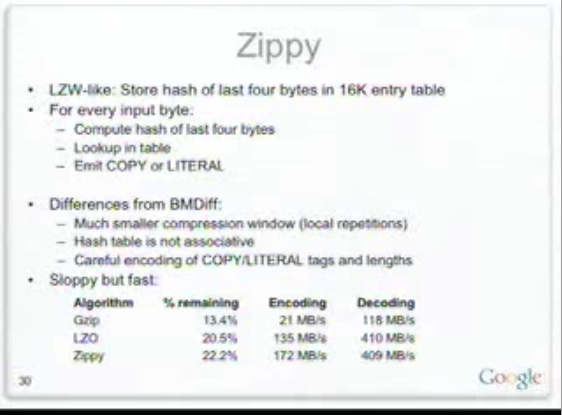 GZip seems to be the obvious choice but its compression speed isn’t very good when compared to LZO. 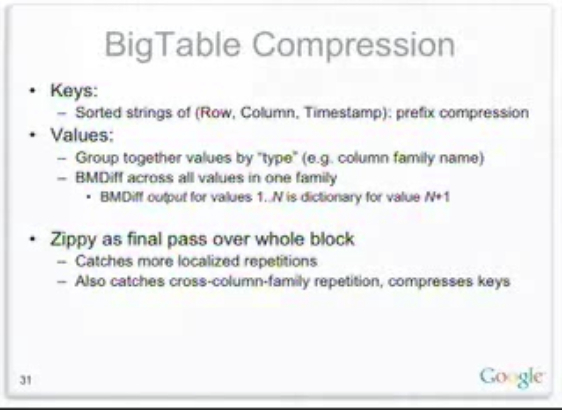 I remembered some notes about compression in the original Bigtable paper and decided to dig a bit deeper. 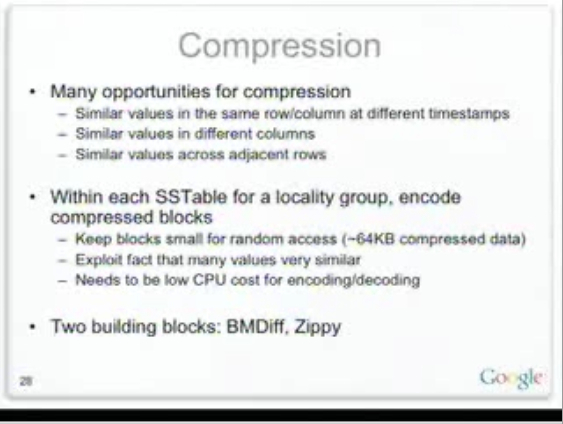 Apparently, there isn’t much information about what Google uses for compression in Bigtable, GFS, etc. These notes were compiled from Jeff Dean’s talk in 2005 but I haven’t seen anything else referencing the subject. Skip to 46:00 in the Dean talk to see the compression notes. The use BMDiff to compute a dictionary diff between all columns in a column family. This way common strings between columns can be stored in a compressed dictionary to avoid duplicate storage. This also helps to diff between previous versions of a page across compactions. A page stored in your index will probably have a LOT in common with the same page stored a month ago. 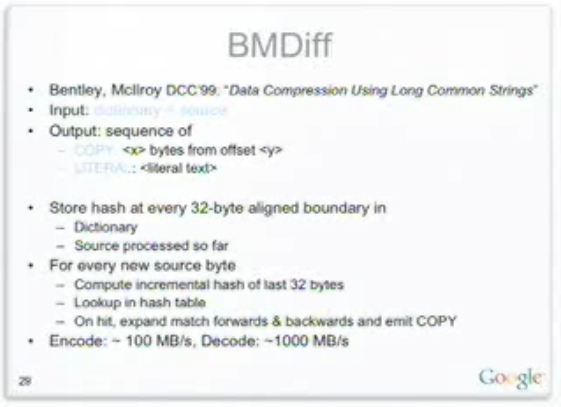 They then run the bmdiff through zippy (another compression algorithm they wrote). Apparently, it’s a tuned version of LZO. I’d like to see MySQL/Drizzle support more higher level DB primitives directly rather than having to build support for these above the DB level. The zlib compress/uncompress support in MySQL is horrible (binary data is not compatible with other zlib implementations). Supporting bmdiff, lzo, bloom filters, etc in DBs is going to be necessary to have drizzle support larger distributed databases. There are a few UDFs I want to write so maybe I’ll take these on at the same time..
Come to think of it, crypto support isn’t that hot in MySQL either. I wrote it (the bmdiff part, lzo is used for the optional final pass) mostly for experiments without much optimization (so there are rooms for improvement). The Rabin-Karp like hash functions can be easily plugged in for experiments. Look at what the Hadoop/Hbase guys uses when compressing. Compression is key in those systems. The quick and dirty implementation, depending on your app, is to use gzip for a column, but only compress/decompress when the data is used — usually on a client webserver. Thus the compression cost is moved into a more scalable layer. Ideally, this would get built into mysql/drizzle such that decompression happens on an access of the column’s data, and if that doesn’t happen on the server, then it passes that flag on to the client. So the client/server protocol would need to be updated as well both the client and server. Why would you delete my comment on an existing easily reusable open source implementation of bmdiff? It’s not like we’re promoting a commercial product. It’s open source and free for all to use. Did you find the paper explaining the algorithm? Which paper? On Zippy? I don’t think there is one. Sorry about the confusion. I didn’t actually delete your post… I just (accidentally) didn’t approve it. It looks like gmail is starting to mark the ‘new comment’ posts from WordPress as spam so I didn’t see that your comment was pending moderation. Cool that you posted your implementation. Thank you for your info Luke!